A native of Orange County, James graduated from Chapman University in 2010 with the dream of starting a production company with his friends as an outfit to combine their creative talents towards a common vision. He thrives on collaboration, whether its with his peers or his clients. This company allows him to fuse two of his passions: film and advertisement. His work ranges from award winning short films to branded content for brands such as Harman and Hormel. 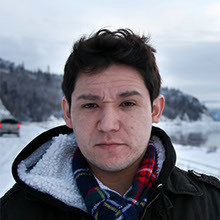 Cristian’s experience as a producer includes branded content, music videos, and short narratives. Additionally, he has over five years of experience in film marketing & PR, having worked on campaigns for major theatrical releases as well as indie films. He recently produced music videos for indie artists, Glass Animals and Shura. Through a lifelong dedication to learning about cinema, Tyler has become a Powerful storyteller. Using his ingenuity, he has created a body of work that ranges from award winning short films to commercials for big brands such as Hungry Man and 5Hour Energy. Malica has worked on major productions in LA and NY. Her background includes features, documentaries, branded content, and short narratives.